Shinya Kumazaki seems to have a fun job. He is the chief creator at HAL Laboratory and gets to dream up major Kirby games. I interviewed him over email recently, trying to satisfy my growing fascination with a series that, at the clip of about two releases a year, somehow manages to be rich in both traditional and experimental games. Lately, almost all of them have been pretty good. “For recent core Kirby titles, I come up with ideas at HAL Laboratory’s Yamanashi Development Center and we get started on small game experiments,” he said, referring to HAL’s offices in a Japanese prefecture at the foot of Mt. Fuji, a couple of hours’ train ride from the studio’s main Tokyo location. Kumazaki has been working on the series since 2003’s Kirby Air Ride on GameCube, and he later became series director for 2009’s Kirby Super Star Ultra on the Nintendo DS. Now he gets to daydream Kirby’s future. For the past decade he’s brainstormed the half of the Kirby franchise that’s traditional, or what he calls the “core” games. They’re sidescrollers that more or less feature Kirby walking and floating across 2D levels, inhaling his enemies, absorbing their abilities and cheerfully fighting his way toward a grand final battle. Traditional as they’ve been, they’ve still each had a twist. “For Kirby’s Return to Dream Land, I was aiming for simple 4-person simultaneous play using Wii Remotes,” he said of the 2011 Wii game. “With [2014’s] Triple Deluxe, I wanted to leverage the 3D capabilities of Nintendo 3DS by having two fields, one up front and one further back, and started devising a world of floating continents that would reflect that idea. 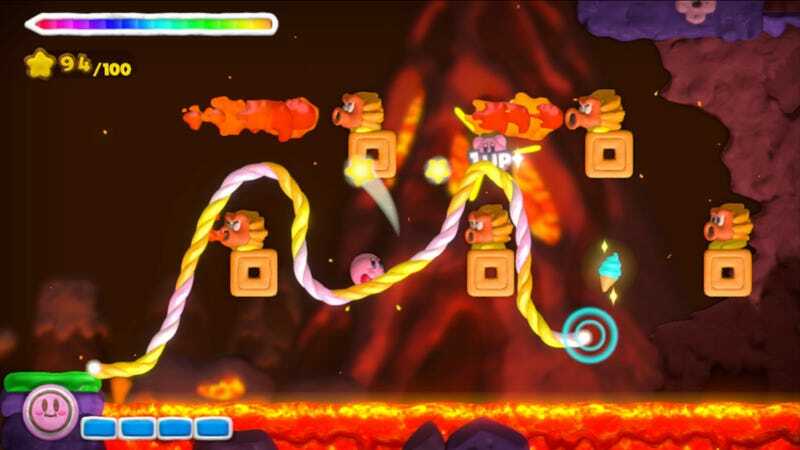 The Kirby series, which dates back to 1992, has long been split between traditional sidescrollers and a host of other kinds of experimental games, which include 2000’s motion-controlled Game Boy game Kirby Tilt ‘n’ Tumble and the stylus-driven Kirby’s Canvas Curse and Rainbow Curse in 2005 and 2015. Kumazaki isn’t as involved in the experimental games but appreciates the dynamic they play in the franchise. “With each passing year, the development of Kirby games gets larger in scale and more complicated,” he said. “Completing smaller games like these is a good experience that gives the younger staff members at HAL Laboratory an opportunity to take up a more active role. 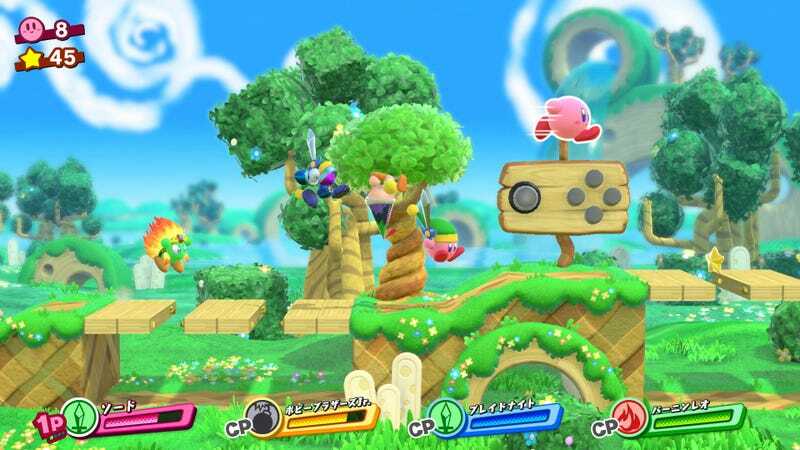 Kirby’s Blowout Blast was originally a mini-game that came about because we wanted to try out 3D action. A younger director worked hard to develop both that title and Team Kirby Clash Deluxe. The most unusual turn of events here is that there are actually no announced Kirby games on the horizon. There has only been one Kirby game released this year, Kirby’s Extra Epic Yarn, and it was a 3DS port of a Wii game. In terms of Kirby, we’d call this a slow year, but there’s no doubt that Kumazaki is dreaming up more stuff. HAL’s next game, the non-Kirby game Box Boy + Box Girl, will be out for Nintendo Switch later this month.